I cannot believe this is my last post for the month! Thank you for the support and taking a look at my cards! 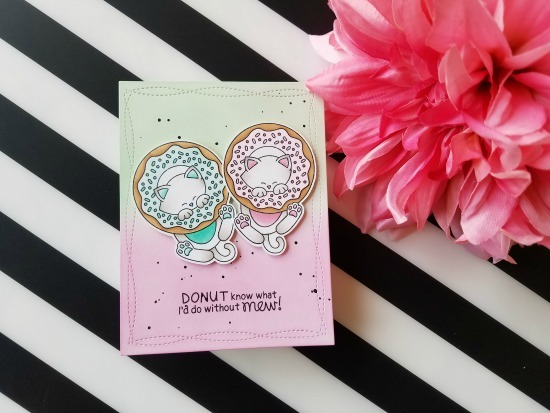 I used the Newton’s Donut Stamp Set again, because it is just TOO CUTE! I cut out a 4 ¼ x 5 ½ inch card front and inked the top half in Distress Oxide ink in Cracked Pistachio and the bottom half in Picked Raspberry. I then added black paint splatters (this is my favorite thing to do) to finish off the background. I then foam taped the Newton’s images to the front and stamped the sentiment “Donut know what I’d do without mew!” at the bottom. The card front can now be adhered to a standard size card base. Simple card, but it is one of my favorites, I love how the Distress Oxide inks blended onto the paper. Thank you all again for taking a look! Hope you try this simple card and thanks for stopping by! They look cute. I was imagining doughnuts. Adorable card! Love this stamp set and the pretty colors you used. This image would be perfect at Christmas with the donut colored in reds and greens! love the color palette! and of course a donut card is the best! !